…This is another fantastic book from an excellent writer. I enjoyed it greatly, and I’ll be looking forward to Goss’s next novel—not least because European Travel for the Monstrous Gentlewoman ends with a cliffhanger. 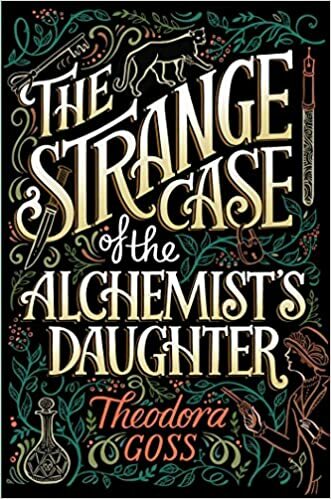 The Strange Case of the Alchemist’s Daughter by Theodora Goss. June 2017, Saga Press, HC, 416pp. ISBN 978-1-4814-6650-9. $24.99 US/$33.99 CAN. Cover illustration by Kate Forrester. Art direction by Krista Vossen. Theodora Goss is an award-winning writer of short stories. It should not be surprising, then, that her debut novel, The Strange Case of the Alchemist’s Daughter, is an enormously accomplished delight of a book. Playful, serious, possessed of great affection for the works with which it is in dialogue even as it critiques them, its deft prose and amused self-awareness of itself as a narrative — its meta-narrative properties — create an extraordinary reading experience. The novel opens with Mary Jekyll, daughter of the (supposed) late Dr. Jekyll, at the funeral of her recently-deceased mother, her last surviving parent. With Mary’s mother’s death, Mary is left without income, and must not only let her servants go, but try to figure out how to earn some money. When an item among her mother’s papers leads her to believe she might be able to find the location of Hyde — wanted as a murderer, for whom a significant reward was once offered — she sets out to discover him, and instead finds herself in the middle of a set of interlocking mysteries, and in the orbit of Dr. Watson and Sherlock Holmes. Who is murdering prostitutes in London and taking their bodyparts? What is the mysterious SA? What did become of Hyde, and did Jekyll really die? The Strange Case of the Alchemist’s Daughter really loves its inspirations. It is delightedly invested in playing with, reworking and re-interpreting, the fantastic literature of the 19th century, and interested in 19th-century London and rookeries. Its murders echo the most infamous unsolved murders of history, and it’s easy to see that Goss is playing with ideas of memory and narrative, myth and monstrousness. This concern with memory and narrative is brought to the fore in the device that makes the novel an innovative delight: the novel is being written by one of the characters as a novelisation of “true events,” while every so often others interject to correct her. Thus the narrative’s reliability (or lack of it) and objectivity (or lack of it) is constantly before the reader’s attention. Goss is playing with constructed nature of narrative, with the idea of narrator as agent. The Strange Case of the Alchemist’s Daughter is directly in dialogue with its inspirations in both structural terms as well as in terms of the characters that Goss is reworking here. The Strange Case of the Alchemist’s Daughter is an energetic book, elegantly written, with a twisty structure that is nonetheless easy to follow. It’s also a novel that makes me want to chew on its themes, and to read the works by which it has been directly influenced — I feel as though I missed at least half the references. But despite that, I thoroughly enjoyed myself: it’s a brilliant novel. You should definitely read it. This review comes to you thanks to my generous Patreon supporters. If you enjoy my work, please drop a penny in the jar.